"At The Center of the Grier Heights Community"
In October 2015 after a year of renovations, the new Grier Heights Community Center opened in the historic Billingsville School house on Leroy Street, in the heart of the Grier Heights neighborhood. An old Rosenwald school built in 1927 specifically to educate African-American children in Charlotte, the school was originally just a frame structure, but the community rallied around fish fries to raise $500, and local residents laid the bricks you see today. Now, nearly 100 years later, the Community Center is listed on the National Register of Historic Places and hosts all sorts of events, classes, programs, and gatherings for the residents of Grier Heights. It's a "no-judgment zone" where resources, connections, and friendly faces are in abundance as the staff and those who meet there try to empower neighbors to achieve their goals and connect with one another. So stop by. Come right in. Find what you're looking for or find someone that can point you in the right direction. We're "at the center of the Grier Heights community," and we're here to help. No stranger to Grier Heights residents, Ms. T has worked in the neighborhood with children and families since 2008 and joined the GHCC staff in Fall 2017. She's the person to talk to about programs, classes, after-school options, youth mentoring... basically everything going on at the Center (and all over Grier Heights too). You need to meet Ms. T.
Grier Heights has had an active neighborhood association since the 1940s. Its officers consist of a president, vice president,recording and financial secretary,and treasurer. Our Mission is to provide leadership that promotes the physical and social well being of the neighborhood. We have a vision of becoming a proud historically progressive neighborhood of beautiful homes and tree-lined streets. We will become a healthy village with spirit and energy. We are family and all are welcome to join our organization. The GHCIO meets on the first Monday of each month at the Grier Heights Community Center which is located at 3100 Leroy St. The meetings start at 7:00. If you are interested in attending, please drop by or contact one of our board members. The Executive Board meets the Tuesday prior to General Body meetings which are held the first Monday of each month. General Body agenda items are asked to be submitted to ghcioinc@gmail.com by 5:00pm for the Executive Board meetings. 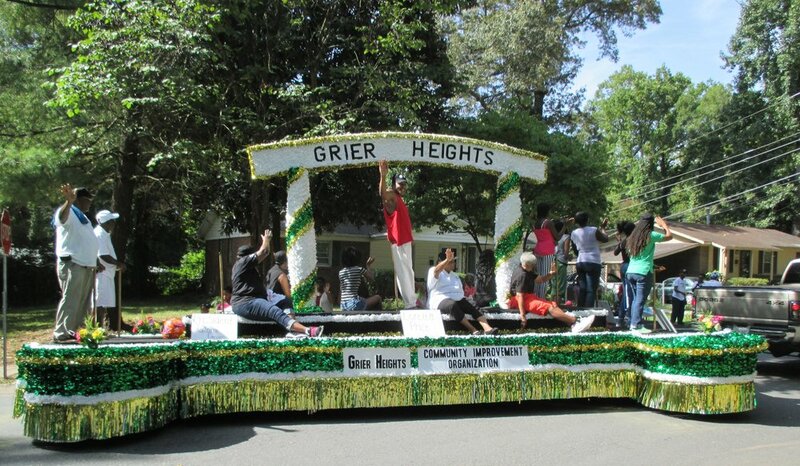 The Grier Heights Community Improvement Organization (GHCIO), Inc. began in the 1940s, however, the community has been around since the late 1800s. This is a community that has an understanding and appreciation of its roots, history and founding values: self-sufficiency, education, empowerment and family. To put this into perspective, the founder, Mr. Sam Billings was an ex-slave and many of the early settlers came from very humble beginnings but possess similar values of many of the residents who reside in Grier Heights (GH) today. For example, the residents want access to a quality education for their children (Just as in 1927 Mr. McDuff Dinkins led efforts to build Billingsville School with help from Booker T. Washington and Julius Rosenwald so that the children of GH could receive a quality education), the residents want houses that they can call home for their families ( Mr. Arthur Grier built over 30 homes for families who returned after WWII), and last but not least, the residents want stable jobs to support their households (Mr. Sam Billings provided jobs and sold many crops to the GH residents). As a community organization, we want to get back to our roots, recognizing that the same values that sustained GH in the late 1800s and throughout Jim Crow and segregation are the same values that will allow the community to continue to thrive today. I share these similarities and values because with help from you, our partners, we want to thank you for all that you are doing for our youth, education, adult literacy, financial literacy, home ownership, entrepreneurship, job readiness, voter registration and all of the programs and services that are offered in Grier Heights. In our monthly community meetings, I constantly remind the residents, GH is a community ‘rich in resources.’ As a GHCIO, we are working together to ensure all of our residents, not just some, take advantage of these resources to improve their overall quality of life and to address economic mobility. Specifically, we strive to be innovative in addressing youth development, college and career readiness and development and community engagement (sub-communities- Randolph Hills, Elizabeth Heights, Grier Park, Marvin Villas) through the formation of committees, to name a few, (Special Projects, Communications, Health and Wellness, Safety/Crime Prevention, Community Service and Fundraising/Development). Lastly, over the next few months, a team will gather to develop further a 3-year Strategic Plan which began in February 2018 at the City of Charlotte Neighborhood Board Retreat to examine and to conduct an analysis on where we are today and what our goals are for a sustainable future. Through all of our efforts in GH we will work hard to help Charlotte to move out of its 50th out of 50 in economic mobility among the largest U. S. cities. Thank you to each one of you for partnering with Grier Heights and helping the community to move towards a prosperous future. Please take a moment to view the photos of the museum in the photo gallery. The best way to find out what's happening at the Grier Heights Community Center is to stop by during operating hours. There's usually something happening, a friendly face, and an open door. If you can't reach us in person, call and leave a voicemail or e-mail us using the form below. We'll try to get back to you as soon as possible.